Featuring two dancing gingerbread men on the front of a birdhouse and a single gingerbread man with apples on the back. 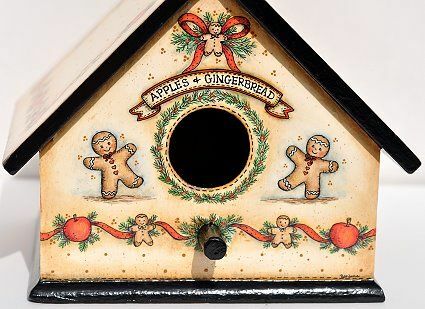 The birdhouse and the roof have a ribbon border with apples, gingerbread men and pine needles. 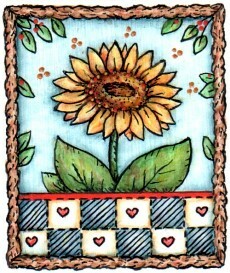 This border design can be adapted to other size birdhouses by lengthening or shortening the ribbon. Depending on the shape of the birdhouse, the roof could be painted a solid color with snow pounced on it. This E-packet contains: Complete directions, three color photos and two full size pattern pages for a total of 6 pages.